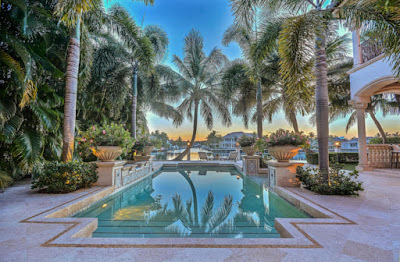 Nestled along a rare 22x60 protected yacht basin within the ultra-exclusive Highland Beach community of Camelot On The Atlantic is this exquisitely crafted waterfront estate home. With 8,800 square feet of living space, this awe-inspiring Camelot On The Atlantic residence offers 5 bedrooms, 6 full bathrooms and 2 half bathrooms. Custom built to perfection, the jaw-dropping interior showcases sweeping views of the Intracoastal alongside a number of ultra luxury features including a dramatic 2-story entry foyer with elaborate ceilings, an elegant formal living room with stone fireplace and Vanderbilt Biltmore Estate chandelier and a massive Master suite with large separate sitting area and separate his & her bathrooms, a gorgeous gourmet kitchen with high-end stainless steel appliances and butler’s pantry, media and billiards rooms, a library and a wine cellar. Perfect for entertaining or relaxing, the resort-like backyard features an expansive loggia with Summer kitchen, a stunning swimming pool with spa and a private boat dock. Additional luxuries offered by this unforgettable home include marble flooring, private elevator, a gas generator and a 4-car garage. 2342 S Ocean Boulevard is located in Highland Beach and is currently asking $7,900,000. This Camelot On The Atlantic listing is courtesy of Nestler Poletto Sothebys Int'l MLS# RX-10145214. Tucked between the Intracoastal Waterway and Atlantic Ocean, Camelot On The Atlantic is an ultra-exclusive community located in the sophisticated coastal city of Highland Beach, Florida. Residents of this coveted community enjoy an enviable location within walking distance to Downtown Delray Beach, Atlantic Avenue and miles of pristine Atlantic coastline.